That G2 leaked pix we showed you other day? That was nothing compared to this new phone Verizon and LG have up their sleeves. The phone is the LG VX9600, or Versa, and once you see what it can do, you’ll see why we’re giving this the title of the COOLEST PHONE EVER! So what you waiting for? Hit the read link and let’s go! Nintendo DSi in Stores April? Remember back in October, Nintendo announced their new DS, called the Nintendo DSi? Well there are rumors going around that the DSi might come around in early April for the price of $179.99. A DSi store, allowing you to buy and download games using the same Nintendo Points found on the Wii Shop Channel. The device screens are slightly larger, and also thinner, because Nintendo is removing the GBA (Game Boy Advance) slot– no more Sonic 3. Aw. Internal memory (to take pictures on presumably) in addition to an SD Card slot. What do you think: Are you going to wait on this rumor? Sound off in the comments. Remember a few weeks back we wrote about Sony’s new netbook? Well they’ve finally been confirmed– the Sony P Series. The P Series will be the lightest netbook around, tipping the scales at about 1.4 pounds! Oh, and it fits into a regular mailing envelope– take that MacBook Air! The LED backlit screen has a 1,600 x 768 resolution, which is one of the best out there for netooks and just stunning. A battery that boasts 4 hours of work time, which could be 8 if you decide to go with the optional high capacity battery. A one touch button for access to Sony’s Xross Media Bar interface for your movies and music and internet browsing, which you can start up without going into full Windows (this is known as a “instant on OS”, as your computer goes on in much quicker time than it would to load the regular OS). Just a small note, this netbook will not include a trackpad but instead have a small track ball in the middle of the keyboard which can be used like a mouse. The P Series will ship sometime in early February in the very creative colors of garnet red, emerald green, onyx black, crystal white and black hues for $900 and up (way too much for a netbook in my mind– heck, you could get 2 fairly decent netbooks for the price of one of these things! ), depending on your specs. So do you think it was worth the wait? Let your voice be heard in the comments. Apple today unleashed the restrictions on the iPhone’s wireless iTunes Music Store, letting you finally download songs over 3G! So me being crazy to try this out, took out my iPhone 3G and put this to the test. I gotta say it works as advertised; I was able to download a 4 minute song in about 1 minute, and my 3G wasn’t even going at its normal speeds! (I think this has something to do with AT&T’s data/internet network going down earlier yesterday morning on the east coast, and it hasn’t fully recovered as of this writing). Anyways, the quality of the songs are the exact same as the ones on your computer’s iTunes, and the mobile iTunes Store even started selling the new DRM free tracks – which you can also download today. Another pretty important thing worth mentioning here is that the pricing on the iPhone’s iTunes store remains the same. Unlike other carriers’ music downloading services (we’re looking at you Verizon, and AT&T with your non-iPhone phones’ $1.99 pricing per song), you’re not paying more than the standard .99 cents to download a song. Oh, and for all you original iPhone owners: don’t worry, this works over EDGE as well, but I would recommend sticking to Wi-Fi for your downloads, as you may not have enough time to sit and wait for your song to download (downloading over EDGE is that slow). 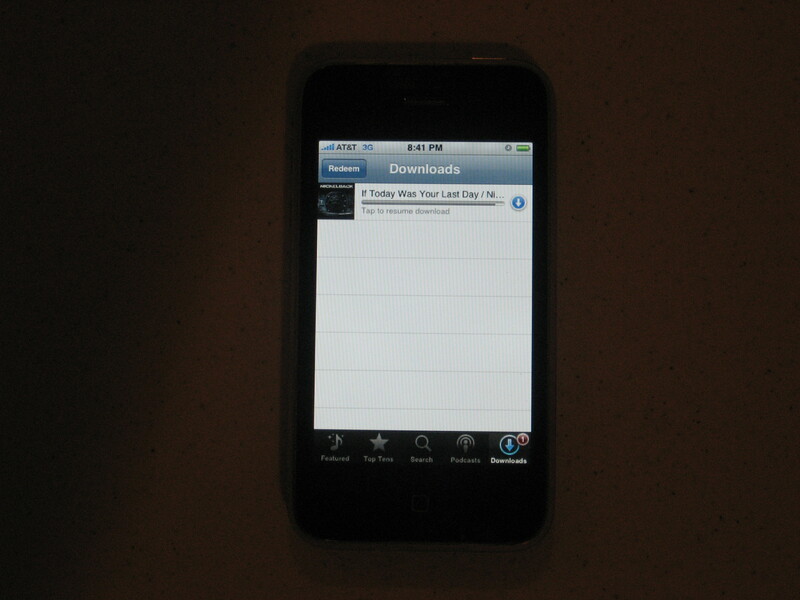 iTunes Music Store over 3G on my iPhone 3G. Click on pic for bigger version. I still was hoping (wishing really) that Apple did more for the iPhone today (please, all I want is: a landscape keyboard like in Safari for texting, syncing with more than one computers like a regular iPod, a lil video recording, and some picture messaging. Honestly Apple, is that so much to ask?). But all in all, the “new” iTunes Store over 3G is great, and gives the iPhone yet another edge over the competition as both a music player and phone. What you think of the new iTunes Store- both the iPhone’s new ability to download over 3G and the new DRM free songs? How the iPhone 3G’s wireless iTunes Store working for you? Let us know in the comments.